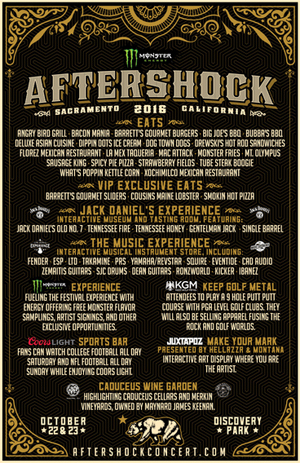 Band performance times, food and beverage options, and additional onsite experiences have been announced for the fifth annual Monster Energy AFTERSHOCK on Saturday, October 22 & Sunday, October 23 at Discovery Park in Sacramento, CA. 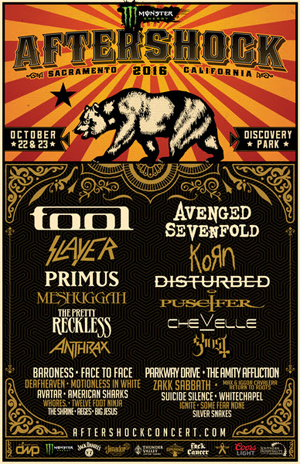 Led by iconic bands TOOL (in a rare U.S. festival appearance) and AVENGED SEVENFOLD, Monster Energy AFTERSHOCK boasts a lineup of 35 bands on three stages, including SLAYER, KORN, PRIMUS, DISTURBED and many more. California’s biggest rock festival also features the return of The Jack Daniel's Experience, The Music Experience, the Juxtapoz MAKE YOUR MARK Graffiti Zone and more to engage fans with all aspects of the rock and roll culture. A very limited number of single-day Saturday tickets for Monster Energy AFTERSHOCK (previously sold out) have just been released. Weekend General Admission and single-day Saturday and Sunday tickets are available at current prices through October 16 or while supplies last at www.AFTERSHOCKConcert.com. Non-service fee tickets are also available at Dimple Records locations throughout the Sacramento area. VIP and hotel packages for Monster Energy AFTERSHOCK are now sold out. Jack Daniel’s Experience: “Taste of Tennessee” invites visitors to come out and tour the nation’s oldest registered distillery from outside the Jack Daniel’s Hollow. Visitors get to see (and smell) whiskey dripping slowly through charcoal and the new oak barrels used in maturing Tennessee’s finest whiskey. The Jack Daniel’s Experience is open to all fans, 21 years old and up, for tours free of charge. Stop by the Jack Daniel’s Experience for interactive engagements throughout the weekend. Whiskies available at the Jack Daniel’s Experience include Jack Daniel’s Old No. 7, Tennessee Fire, Tennessee Honey, Gentleman Jack, and Single Barrel. Life Looks Good On You: Monster Energy AFTERSHOCK has partnered with Sacramento County Department of Regional Parks for the Life Looks Good On You life jacket water safety campaign. Danny Wimmer Presents is pledging support with Monster Energy AFTERSHOCK alumni and DWP friends to create awareness for the Life Looks Good On You campaign. So far, music artists that have joined the efforts include Sacramento’s own Deftones, Rob Zombie, Disturbed, Five Finger Death Punch, Papa Roach, Pop Evil, and Avatar. Photos of band members wearing life jackets will be part of a social media campaign designed to encourage people to safely participate in water activities by sharing photos of themselves and friends wearing life jackets. LTD (Living The Dream) Foundation: A portion of all Monster Energy AFTERSHOCK ticket fees will be donated to Living the Dream. LTD Foundation bridges the music industry together with fans who are fighting terminal illnesses by giving them All Access VIP experiences backstage with their favorite bands and artists. The most convenient way to get to Discovery Park for Monster Energy AFTERSHOCK this year is to use the Park & Ride program. Each Park & Ride ticket includes parking for one vehicle at Sleep Train Arena and a non-stop shuttle directly to the festival site for all passengers. Single day and weekend Park & Ride passes can be purchased at http://aftershockconcert.com/parking-shuttles/. Monster Energy AFTERSHOCK is produced by Danny Wimmer Presents, a producer of some of the biggest rock festivals in America, including Rock On The Range, Monster Energy Welcome To Rockville, Monster Energy Fort Rock, Monster Energy Carolina Rebellion, LOUDER THAN LIFE, Northern Invasion, Monster Energy Rock Allegiance, Chicago Open Air, and more.